Are you looking for an affordable and sophisticated flooring option for your home’s kitchen, living room, bedrooms, or any other area? Consider choosing our flooring showroom to find a wide array of luxury vinyl flooring in Santee, CA. We carry a variety of styles, colors, and patterns perfect for any room or interior style preference. Whether you’re looking for something bold and modern or comforting and traditional, we’re sure to have something to suit your taste and price range. If you’re in need of interior design assistance, guidance, or help to find the best style of flooring for your home, our flooring professionals are always on hand. Visit our flooring showroom to peruse our selection of flooring, discuss your home remodeling project, and schedule a luxury vinyl flooring installation. Luxury vinyl tile and plank flooring are not only stylish and attractive – they are also very easy to maintain and clean. Luxury vinyl flooring is also incredibly durable, making it perfect to use in high-traffic areas like hallways, kitchens, and living rooms. Keep your gorgeous new floors looking and functioning great for many years to come by properly maintaining them. Vinyl does not absorb moisture or dirt, so it’s easy to simply wipe these things away as messes occur. Regularly sweep and mop your floors to remove dust, dirt, and pet dander and keep your floors looking brand-new. Because luxury vinyl flooring is made of man-made material with 3D printed images and textures, it can imitate virtually any natural material available. From the distinct texture of natural stone to the delicate and unique patterns of marble and granite, luxury vinyl tile is available in many different styles. Luxury vinyl plank flooring is created to imitate the look and texture of hardwood flooring without the cost and maintenance needs. It is available in virtually every species of wood, woodgrain appearance, texture, and plank size. This is the perfect option for any homeowner who desires the sophistication or traditional appearance that hardwood offers, but prefers to stay within a more reasonable price range. Keeping your flooring in great condition is easy with proper maintenance and installation. By allowing our professionals to provide luxury vinyl flooring installation, you know your floors are sure to last for many long years. 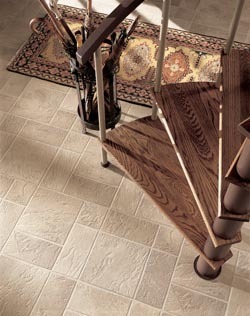 Be sure to schedule installation with our team after you choose the perfect flooring style for your home. Contact us to schedule luxury vinyl flooring installation with our skilled professionals. We’re proud to serve clients in the Santee, El Cajon, and the surrounding areas.